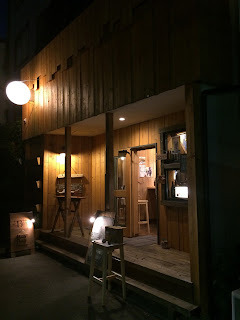 Today, a brewpub in Kita-ku, about 10 minutes from Shinjuku on the Saikyo line. It's nice to see that we have brewpubs opening as well as bars, as I imagine it is much more of an effort to set up a brewery than a bar. Also, given that many new places are offering similar concepts and similar beer lists these days, it's nice to see someone doing something different. My first impression was something along the lines of 'What is it with Tokyo brewpubs and the lots of wood interior thing? ', clearly approaching the place with the Chuo line Beer Kobo pubs in mind. Whilst it's true that there are a few similarities between those places and Beer++, I think Beer++ has its own thing going on, and they can only be compared on a basic level. So, yes, it is a wood filled Tokyo brewpub, appealing to a mixed local crowd and with an emphasis on eating and drinking. But its beers are a little different (a couple of the seasonals seemed to be single hop US style IPAs). And to be honest, the beers are the most important thing, aren't they? They have five taps, four of which were their own beers and one of which was a US import cider. But I think that usually all five taps are their beers. The three regular beers seem to be the Pale, Amber and Citra. Unfortunately the Citra wasn't on when we visited. Aside from these they have a blackboard showing their seasonals/one-offs. All beers are served in two sizes, 500ml and 250ml, priced from ¥800-¥950 for the large and ¥450-¥550 for the small. So it's clear that the prices are good and there is no ambiguity about the serving size which is nice. The food was pretty cheap too, although the portion sizes are a little small, so maybe treat it as a Tapas kind of place. I must go back some time to try the Citra as it seems to be the one that people liked the best. The place itself is split over two levels. The ground floor which houses the counter and the brewery is pretty small with a couple of small two-seater tables and a counter for maybe three or four. Upstairs is a bit more open. There are around 30 seats at various sized tables. It is table service, so once you are settled upstairs you'll only need to go back down for the loo, or to leave. The staff were friendly and helpful and it was a very pleasant experience. There is also no cover charge! All in all it's a really nice place and surprisingly quick and easy to get to from central Tokyo. It's great that they have opened in an area where I don't think there is much going on beer-wise. And it's also great that they are doing their own thing rather than taking the easy option. The fact that they want to make their own beer suggests that they have opened for the right reasons. It seems that recently there are a lot of new places opened purely to make money surfing on the wave of the craft beer trend. A place with its own vision is far more likely to succeed and I think they should be given all the support that we can give them. Good luck! From Jujo JR station, leave via the North Exit and turn left out of the station. When you get to the road, cross it and head left towards the level crossing. At the level crossing turn right down the alleyway next to the train tracks and you'll see the brewpub.